Every day, Jose Faber Cabrera passes by the Pasig River and this is the story of how his advocacy to help save the river began. "Every day, when I am going to my Ninang's (god mother's) house, I always pass by the Ilog Pasig and see how dirty it is. I felt sad for it so I thought I could start a project. Then the idea came." Faber explained. Faber is 10 years old, currently in grade 5, and the Environment Officer of his class. He has been leading for the past three years. 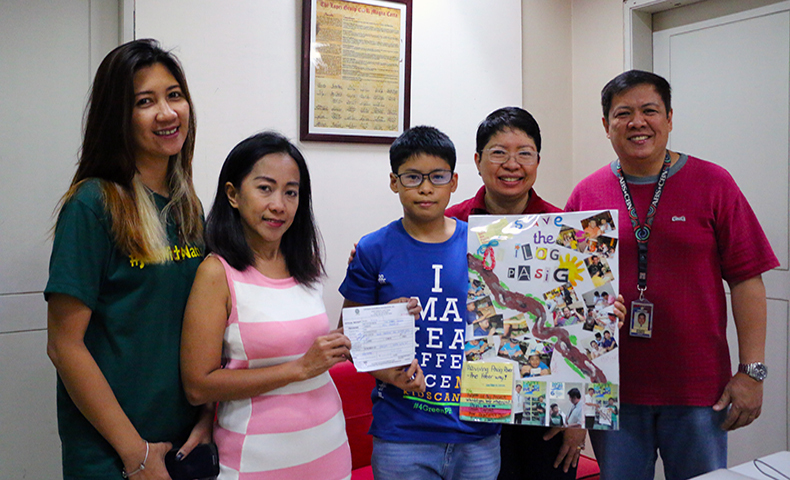 Two years ago, he visited the ABS-CBN Lingkod Kapamilya Foundation's office with a big smile on his face to turn-over his donation of PHP 2,000.00 from the sales of his first project to Kapit Bisig Para sa Ilog Pasig (KBPIP). He created loom bands or bracelets using small rubber bands and sold them to his family. Every year, his school encourages its students through its "Kids Can!" program where they get to choose and work on their own advocacies in their own little ways. This program believes that kids like Faber can make a change. In 2016, he created shoe bags and was able to give PHP 5,000.00 from the sales. This year, a taller Faber with a bigger smile once again paid a visit to KBPIP to give the PHP 7,000.00 he earned from selling the aprons and multi-purpose bags he crafted out of flour sacks. 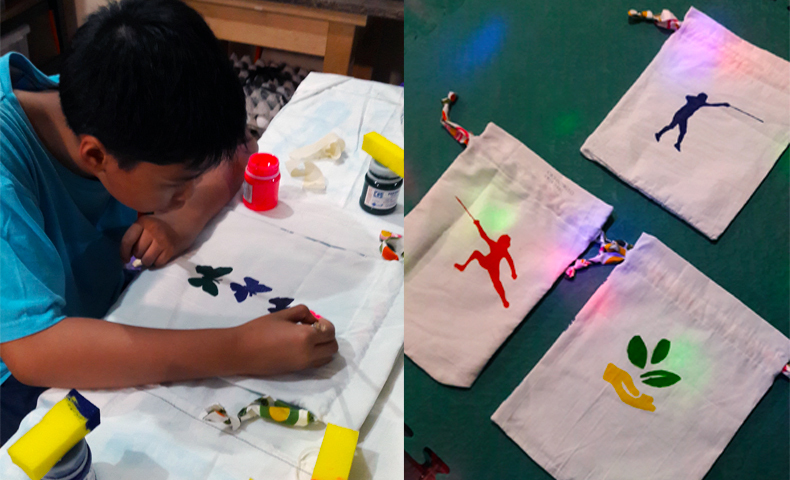 His grandfather gave him the sacks, he and his aunt worked on sewing them, and together with his Mom, Maita Cabrera, and their driver, Faber painted on them using stencils. 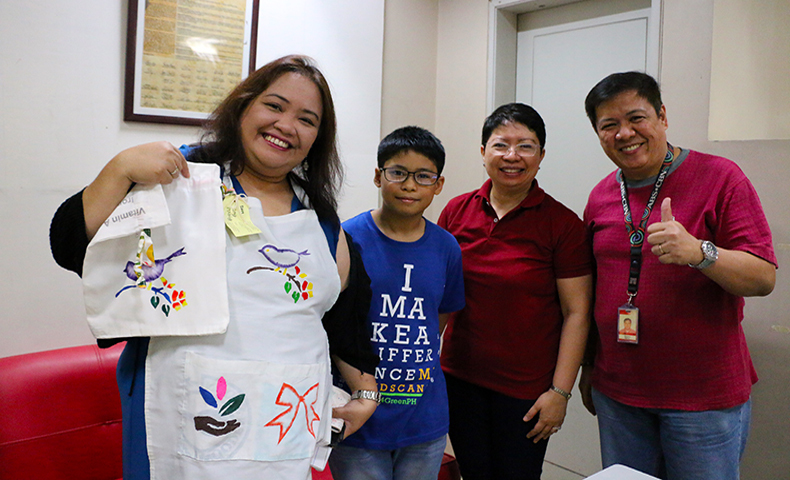 In photo: (L-R) Jen Chan (ALKFI-Integrated Communications Division Head) wearing and showing a sample of the bag and apron Faber made with Jose Faber Cabrera, Maita Cabrera (Faber's Mom), and Rino Ramos (ALKFI Senior Donor Relations Specialist) during the turn-over of the donation. “Parents' guidance and support plays a big role in children's accomplishments,” said Mrs. Cabrera. "Normally, they are focused on academic work and not really exposed to every day situation. Maybe, the best thing is getting them aware of what is happening in the environment and get them to think for themselves where they can help and what they can do; and we will be surprised with the many ideas they can come up with," Mrs. Cabrera shared. "They do not have inhibitions so you can really see. Sometimes, they go over the moon but then, it can lead to something more. We tend to protect them a lot but actually, if you expose them to reality, it will help them build their character, build their concern for whatever their advocacy is," she added while proudly looking at her son. Isn't it a breath of fresh air and a ray of hope to see a child so young care for the environment? "If you have a heart for the environment, start making a change now." Faber reminded. Kapit Bisig Para sa Ilog Pasig is the river rehabilitation project of ABS-CBN Lingkod Kapamilya Foundation's environmental arm Bantay Kalikasan. To date, 16 river tributaries connected to Pasig River have been rehabilitated by KBPIP with the help from its partners, donors, and volunteers.